Complexities, Capacities, Communities cover image is under a CC BY-NC 4.0 license (https://creativecommons.org/licenses/by-nc/4.0/). 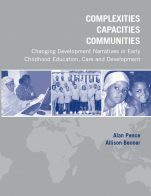 Complexities, Capacities, Communities: Changing Development Narratives in Early Childhood Education, Care and Development by Alan Pence, Allison Benner is licensed under a Creative Commons Attribution-NonCommercial 4.0 International License, except where otherwise noted. As a description of programme evaluation this book is quite comprehensive. The authors have a longevity with international projects and have accounted for their activities in a thorough manner, to share with others how to undertake such projects. 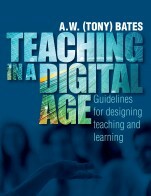 I do not give this book a full 5 out of 5 rating, as I wanted the authors to situation the text more fully in programme evaluation rather than the context, e.g., early childhood. Also, as the authors note, they drew from initiated interations with Indigenous Peoples in respect to the 'how' of developing international programming, an important piece of this work. I would have liked to have seen this collaboration discussed in more detail, especially along the process pieces. Again, I would have liked this to have been situated more fully in Canada's historical context with the Africas, especially the work of Foster (2005: Where race does not matter: The new spirit of modernity). There are voices and chapters from international collaborations in this text, but I found myself looking for richer narratives as promised by the title. Unbiased is a difficult word. Yes, this text does have longevity and relevance to programme/capacity development for international collaborations, it definitely provides sufficient information as a method to initiate this kind of programming, I was hoping for more grounding and the procedures being informed by Early Childhood Education (ECE), in the sense of what we know and do. I found it more method based for capacity development and I was hoping for more of a balance with ECE knowledge and theory informing the overall process. 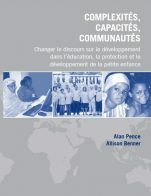 Yes, this a clear text for capacity development. Some technical terminology but it was more that some of the terminology used needed to be unpacked and described more for a fuller and deeper dive into the work. Capacity development in international collaborations is important work, and the authors have undertaken important work in collaboration, but ideas around colonialism, privilege, and the choices of capacity development etc., needed more attention. Yes, there is consistency, in this case it is the framework of what took place. Yes, the chapters and different authors who contribute, I think provide this text with an important modularity component. Yes, the text has a good flow and is sequentially organized. I only reviewed the available paper copy (I will look to see if an online version is available yet). For the paper copy, my only comment is the use of abbreviations may cause some issues and if the text is used in a modular fashion I would recommend a glossary for each chapter (I know!). Here I had a few more issues, I think language needed a bit more attention and description. For example, the authors spoke of Africa I think this should have been the Africas, for example (e.g., Adichie's Ted Talk on the Danger of the Single Story). Although the authors address colonialism and privilege I don't feel it was adequate and still find myself with some discomfort. I recommend this book as a way to think about programme evaluation, capacity development, and international collaborations. I think it does a thorough job of describing the method used and some considerations. I think some situating the goals of the collaboration more fully in ECE theory would have strengthened it, in that way, I found the book more surface. I would use this text to begin to generate questions around privilege, knowledge, theory, collaborations and colonialism. I think these important issues are raised and I would use the text to delve more deeply.